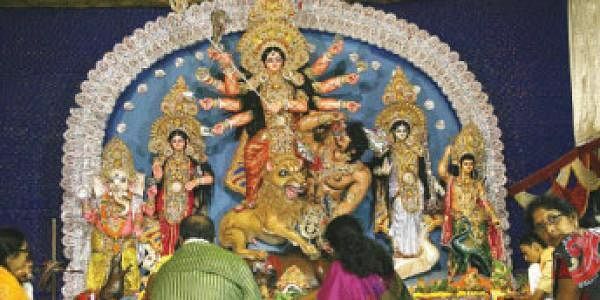 For lakhs of visitors to the millennium city during Durga Puja this year, pandal hopping could well be far less chaotic and more enjoyable. For, armed with the all-important information on traffic movement through Cuttack every hour, they would be able to successfully take their routes and approach the pandals or their destinations without getting stuck at traffic restrictions. The Commissionerate Police on Tuesday launched a technology-driven ‘Variable messaging system’ to disseminate information and message to the commuting public through electronic display at Madhupatna Square. Inaugurated by Commissioner Sunil Ray, the display system would provide real-time information on traffic movement and regulations in Cuttack, right at the point of entry. Thus, commuters and visitors to Cuttack would be aware of the situation before-hand and be able to take the alternatives. This is the first display system to be put up in the State and is developed on the lines of metros like New Delhi, Kolkata and Mumbai. The City traffic unit would carry information as soon as it develops and constantly update it with special personnel deputed for the purpose. Road safety messages and other important information would also be put on display. Traffic is a major problem for lakhs of visitors, who come to Cuttack to witness the world famous Durga Puja celebrations. Flashing information on the traffic regulations like imposition of one-way, restrictions on movement on any particular stretch __ all as instantly as they are imposed __ would empower the commuters and visitors to take diversions or be in a better position to negotiate the snarls and jams. The system developed and implemented by Bhubaneswar-based Bontronics is all set to be extended to two more locations in Bhubaneswar. Display boards would be installed at AG Square and the office of the DCP, Bhubaneswar, by the end of this week, proprietor of Bontronics Gautam Banerjee said. Senior officers, including DCP, Cuttack, Praveen Kumar and ACP, Traffic, K C Samal, were present.